It’s not too often you majorly change up the kitchen, and so when you do it’s important to choose materials and design features that you will still enjoy many years down the road. Kitchen cabinets tend to take up a large majority of any kitchen renovation budget. 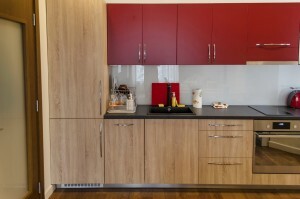 Cabinets make a huge style statement and contribute to the overall functionality of your kitchen. And you are in luck, because the latest kitchen cabinet design options for 2015 are better than ever! As more people try and decrease their ecological footprint future homes (and kitchens) are expected to be greener, and more efficient. Selecting the right kitchen cabinets can help you accomplish this. The following 10 cabinet design trends on the rise this year might be just what you are looking for to add that extra special ‘wow’ factor to your kitchen. Today, the saying “less is more” is often used to describe popular cabinet choices. Designers are looking to emphasize clean lines and simple cabinet designs that offer more functionality as opposed to gaudy standout characteristics. This benefits you in the long run, as you will be less likely to get sick of looking at cabinets that stick to a more basic style. This also allows you to transform other elements of your kitchen later on without worrying as much about the cabinets still matching. For many years the focus has remained solely on the outer appearance of cabinets, and less on the actual space and functionality behind closed doors. Modern innovations now offer so much more than beautiful cabinets. There are endless ways you can make your cabinets truly go to work for you. Cabinets no longer have to be dark, dim places where things get lost forever. Pullout trays, specially made breadboxes, and built in spice racks are just a few of the awesome additions your cabinets can offer. Small, unused spaces dressed up as ‘fake’ cabinets are just not acceptable any longer. Thanks to custom cabinetry you can turn even the smallest and most wasted areas of space into super functional cabinets built to store uniquely shaped items, such as pizza pans and baking sheets. 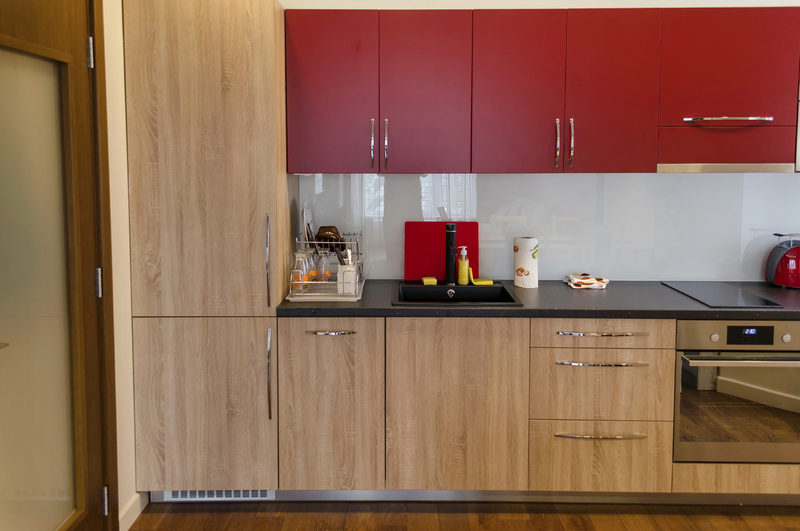 Wood cabinets have remained popular for many generations, although over the last decade oak wood has seen a decrease in popularity, but not anymore! According to recent data, the number of oak wood cabinets being ordered in the US and Canada have suddenly seen a huge surge. Many designers are calling black kitchen cabinets the new white kitchen cabinets of 2015. While black kitchens are certainly on the rise, white and bright kitchen cabinets are expected to remain incredibly popular throughout 2015. White or off-white shades make a kitchen appear clean, as well as larger than it actually is. With a few coats of white paint you can transform almost any cabinet material. Plus, white cabinets go great with many different kitchen styles, from modern appeal to rustic country charm. Stainless steel hardware has been used for years to create cabinet door handles and more. A new rising trend in kitchen design is using oil-rubbed bronze for cabinet hardware. This dark, and glamorous material can be carried through to other elements of your kitchen such as the sink faucet, towel hanger, or pantry door handles. The dark appeal stands out especially nice on white or light colored cabinetry. If you are looking for something less dark and intense, other nice finishes included brushed nickel or chrome. Ditch the plastic cutlery holder and have your cabinets pre-made with all of the dividers you need to store your silverware, knives, and even dishes. All of these features help you better organize your kitchen, and reduce clutter. Plus, it looks really cool to open up your drawers and see a perfectly designated space for everything. Placing glass doors on a few cabinets is a popular trend that continues to gain traction. Glass face cabinets offer a place to store your fancy China, or other pretty kitchen accessories, keeping them out of the way but still beautifully on display. Glass doors also help break up rows of the same cabinet faces, giving your kitchen more dimension and overall style. You can easily add a few glass doors to a couple of preexisting cabinets for a new look that is fresh and fun. Let’s face it you can never get enough cabinet space, which is why this trend is so popular. More and more kitchens are incorporating floor to ceiling cabinets on designated walls. You can break up the monotony of cabinets by adding decorative molding at the top, and using a mixture of glass-faced and solid-faced doors. Pretty hardware and different style cabinetry, for instance mixing horizontal, vertical, large, small, and pull out drawers also helps break up the mass of cabinets. Floor to ceiling cabinets offers room for everything, reducing the clutter in other parts of your kitchen. Tops Kitchen Cabinet offers affordable wholesale prices on kitchen cabinets, countertops, and accessories. Check out our wide variety of inventory today for the kitchen of your dreams at a price you can afford.